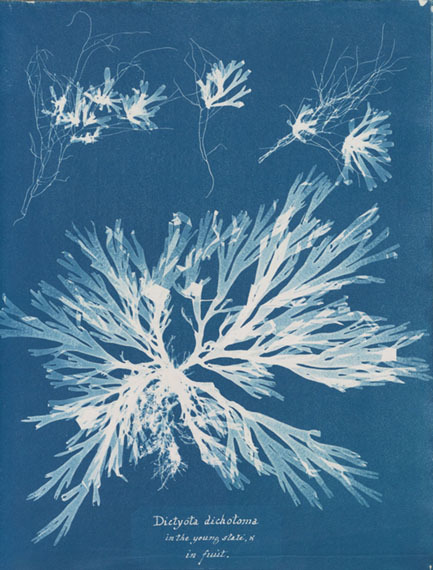 Anna Atkins, "Dictyota dichotoma, in the young state; and in fruit" from Part XI of Photographs of British Algae: Cyanotype Impressions, ca. 1849, cyanotype. 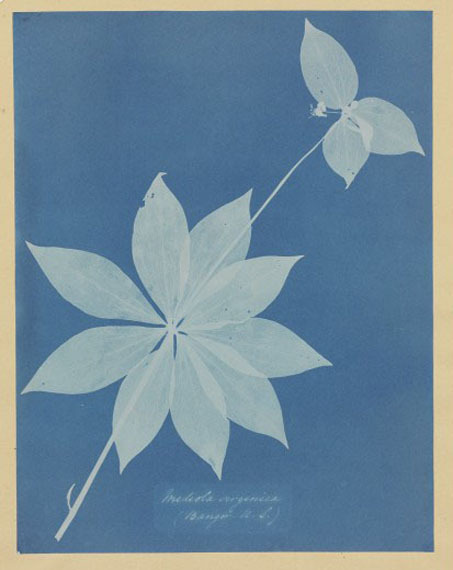 ANNA ATKINS , Mediola Arginica (Bangor, US), 1852–1854 , cyanotype photogram , $15,000–25,000 , , Atkins was a friend of British scholar, scientist and aristocrat Sir John Herschel, who invented the cyanotype photographic process in 1842. By the next year, Atkins was utilizing the process to produce a study of algae and seaweed, which she then later applied to a variety of flowering plants and ferns. This particular piece is on the cover of the Hillman catalogue for its graphic clarity and exquisiteness.